A singularly accomplished bass innovator in the fields of jazz, free improvisation and new music, Mark Dresser has devoted himself in recent years to pushing the capacities of solo bass performance even further. 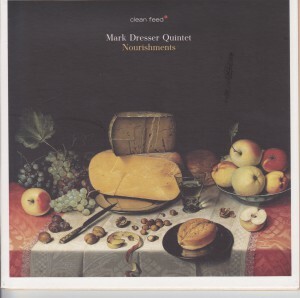 In “Nourishments,” his first quintet recording in almost two decades, he shifts his attention back to another longtime creative commitment, ensemble exploration with a team of master improvisers possessing unmistakable sounds. Featuring Rudresh Mahanthappa, Michael Dessen, Denman Maroney, and, in turns, Tom Rainey or Michael Sarin–all leaders in their own right and players deeply versed in Dresser’s music–the quintet delves headlong into his richly suggestive compositions. More than anything, Dresser creates vehicles for beautifully modulated interaction via counterpoint, cyclical organization, timbre sculpting, and all the unexpected combinations of pitch and noise or meter and texture. He developed several pieces with trombonist Michael Dessen while they were in different cities through telematics, fiber optic-facilitated remote performances that have opened up new astounding new possibilities for international collaborations. By whatever means, “Nourishments” is the work of artists who connect musically, emotionally and intellectually with unusual power and grace. This is it!